I know I panned the second film hard despite its fans, yet this film got me really excited. Two of the five best characters were confirmed to have starring roles, and I really enjoyed the trailer’s fourth wall breaking humor. I then saw it really quick after it hit stores, and I was not disappointed. After revealing that Timon and Pumbaa are watching by rewinding past the beginning of the main movie they show where the meerkats live in “the pit of shame.” “Diggah Tunnah Dance” is the first song about the meerkat way of life, hiding. In a deleted scene they also touched on them considering bravery to be stupidity despite their example, Fearless Ed, having won many battles against hyenas before they finally got him. After everything is going well the entire tunnel comes down thanks to a skylight Timon was trying to make. To add insult to injury the skylight then falls apart. Apparently this happens all the time, as Timon tries to “Shed a little light on our pathetic existence.” His mom then tries to tell him that their job is to hide so they can dig so they can hide some more, and he must be able to fit in somewhere. Timon wants a better home that is not from the dirt. Then his mom gives him some wisdom. “Look out to the horizon, past the trees, over the grasslands. Everything the light touches. Belongs to someone else.” For those two lines this is already worth watching, and they further deconstruct the main film like when Uncle Max says they fear all, are feared by none, and they are simply food for other animals. Timon counters that they eat grass the carnivores turn into, but Uncle Max then points out they are grass intolerant. I just checked and that is true. His mom then gets him put in sentry duty with the entire clan backing her up, as it keeps Timon out of the tunnels. The problem is he breaks into song. The song is actually quite forgettable except for three small details. The best three characters are back. To show their added threat level with these smaller protagonists they are drawn much bigger (by putting the camera lower) and darker. They knock Timon back to the hole, and walk in dramatically. From what I heard if they do that you are as good as dead. They play around with he meerkats (clearly they just ate and are jut having some fun), and they even eat of some of Uncle Max’s skin or fur. Timon tells everyone to trust him that they will be laughing at his failure in the future, and Uncle Max replies with “I did trust you.” Timon accepts responsibility and leaves for a better home after he says goodbye to his mother. After this they make a series of places from the first film their home only for something from the original movie to get in the way like hyenas, noisy singing neighbors, or a stampede. These parts notably include them calling each other “acquaintances” and Timon going from demanding everything in a home to just the bare necessities. I really enjoy these alternate points of view on the first film’s scenes despite the plot hole that apparently Simba grew from a baby to a little kid in one day. Eventually they are stuck on a river together. After that they wash ashore and Timon accepts his inevitable death telling Pumbaa to go back home, and for the first time he calls him ‘buddy” instead of “acquaintance.” It also happens when Timon is thinking of Pumba instead of just himself. Pumbaa refuses, as Timon is the closest he has to family, which is something Timon actually has, but Pumbaa is his only “friend,” and they decide they will go through a rough life together. 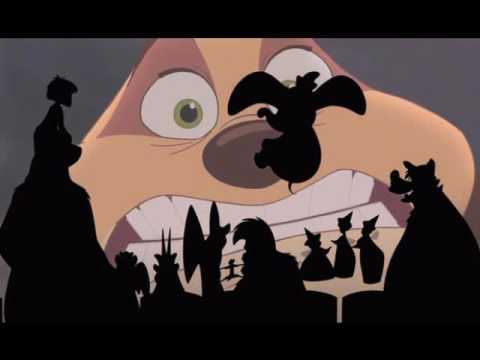 They find their home from the main movie, and proceed to sing “Hakuna Matata.” Unlike the Jungle Book 2, which kept singing their signature song over and over, this is the only time it is sung, and it is great, especially when Pumbaa tries to eat the sing-along grub. After this they decide to play with the buzzards, as it “will not change their lives.” Hence they meet Simba, but they now must face the real great danger, parenthood. After some great scenes of young Simba playing with his meerkat dad, some red herrings about his duty, and some simple gags at Timon’s expense they foreshadow the theme. It is that to have a happy life one needs friends, so naturally they are even happier with three instead of two members. Also Simba and Timon only once really act like father and son instead of as good friends, partly as the writers are showing them as Simba’s providers and friends when he is mostly grown, as Mufassa is his father still. Things are good for them until Nala arrives. To break them up they intend a few gags, which all backfire leading to more romance and pain on Timon. Simba leaves the next morning, and it takes Timon and Pumbaa many attempts to figure out what is going on. Timon feels betrayed by Simba and refuses to go help, and probably as he is not a good choice for a fight. When Rafiki comes to talk with him Timon just mimics him in a conversation with himself that lets him see the error of his ways without someone else really talking to him. I really enjoy seeing that change. At Pride Rock they reveal that they escaped the hyenas post diversion with Pumbaa’s gas (I had been wondering how they did that for years), and then Uncle Max and Timon’s mom show up. They make the plan to separate the hyenas from Scar with a huge tunnel, but they need to stall them so Uncle Max and Ma can finish it. Timon proposes marriage to the female matriarch. Interesting fact female hyenas can not turn into males as is commonly believed, but they do have penises, and three times the testosterone.I am now wondering what their children would look like, as Timon mentioned, but thankfully Shenzi and Banzai end this conversation. Also this happens during Simba’s duel with Scar making another plot hole, as the Hyenas should be watching that. Thanks to some more heroics from Timon the hyenas get stuck in the tunnel, and Simba thanks them at his coronation. Well of course, they raised you. Timon’s mom wanting them to rewind it, and many other characters show up, even from “Song of the South.” I cannot blame them. Despite its lousy climax I love this movie. With the possible exception of Pooh’s Grand Adventure this is the best of the Disney sequels. This is more consistently good, but Grand Adventure is notably superior at times. This film is simply a great comedy.